- Put water, yeast, honey, 1 tbsp oil and about a cup of the flour into a bowl and mix until smooth. Cover with a towel and leave in a warm spot for 20-30 minutes until it all froths up and looks foamy. - Mix in the rest of the flour, the Italian seasoning, garlic powder and the salt and using a dough hook, mix for 4-5 minutes until it's well incorporated. I have a stand mixer, but if you don't she recommends you just mix it with your hands by slapping it around the bowl for a while. Cover the bowl with a towel again and let it rise in a warm spot for about an hour and a half. It should puff up a great deal. - Lightly oil a rectangular baking dish (11x16). Punch down the dough lightly and carefully spread it in the dish, gently stretching it to the edges making sure it's mostly even. If it won't stretch, leave it for a few minutes and come back to try again, but don't rip it. Tent it with a towel (put some glasses around the dish and drape the towel over them) and let it rise again for about 45 minutes. - Wash and dry the red peppers and rub completely with a bit of olive oil. Place on a baking sheet and broil them until their skin is nicely charred, checking and turning them every few minutes to make sure it's even. - Turn down the oven to 450F when you're done, put the peppers into a bowl and tightly cover with saran wrap to let them steam and cool a bit for about 15 minutes. - Slice the onion into thin ribbons and cook with a bit of olive oil on medium in a large skillet, stirring frequently until they're soft and a nice caramel color. Set aside. - Mix the remaining 1 tbsp of oil with about a half cup of hot water and a teaspoon of salt. Stir until the salt dissolves. - Make some dimples in the dough with your fingers and brush well with the water mixture. Put in the oven and bake for about 20-30 minutes until the bread is golden on top. - While the bread is baking, uncover the peppers and carefully peel as much of the skin as you can. Take out and discard the stem, the seeds and some of the inner membrane and slice the peppers into ribbons. Add to the onions and toss together. - Let bread cool a bit and then pop out of the pan and cut into pieces. 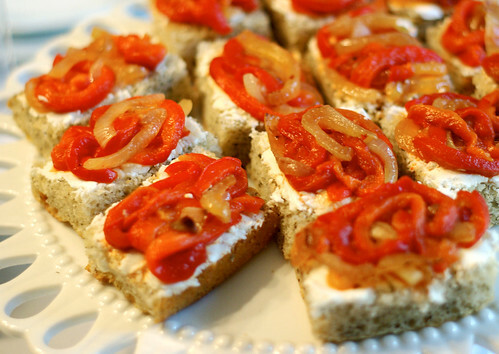 Spread some goat cheese on each slice and top with the pepper mixture. Enjoy!